Level of difficulty * * *, Maximum altitude: 5480 m, Best season: Spring and Autumn. Option: We can optionally go through the Cho La pass (lodge or camp) and/or the Kongma La pass (camp only). Please, request a quotation. in 5 h. Rhododendrons forests give way to junipers and tall conifers. After Dole the landscape gets rocky and only a few trees are left. First sights of the Cho Oyu (8153 m). en 5 h. Slope gently up through grassy areas. The gradient becomes steeper as we go and we end walking through screes and rocks. The access of the pass is tricky and quite steep. At the top, a stunning panorama unfolds: Tengi Ragi Tau, Rolwaling Himal and the small Rermo Pokhari lake on west and Gyachung Kang, Everest, Lhotse, Makalu and the Gokyo lakes on east. We camp beside the lake. 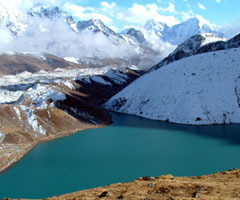 en 5 h. Via Dudh Pokhari lakes, we pleasantly descend through meadows towards the Bhote Khosi valley to continue along the river. We will probably meet some of the picturesque yak caravans climbing down from Tibet and heading to the Namche market. in 4 h. Many of the typical mani walls and prayer wheels are spread on the trail toNamche.